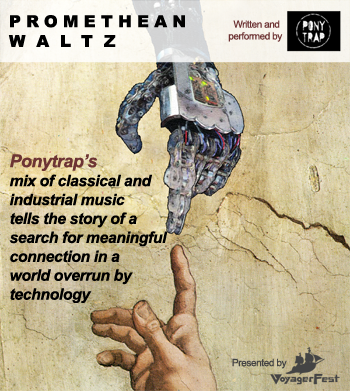 Ponytrap’s enthralling mix of classical and industrial music provides the foundation for Promethean Waltz, a new theatrical production that tells the story of a search for meaningful connection in a world overrun by technology. The performance will combine video projection, new music, and robotics to create a groundbreaking and interactive theatrical experience. The electronic group eBurner will open the event. Sign up for VoyagerFest Email here. Secure covered parking is offered to patrons at the One American Center parking garage. For additional parking information, please click here.